Look at all these gems I harvested from my backyard. 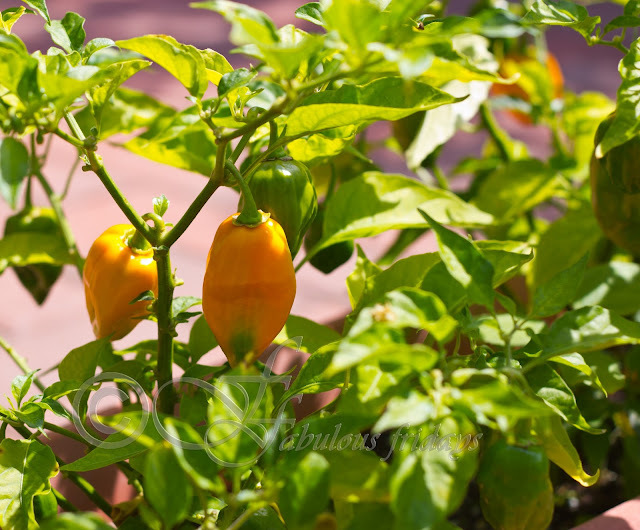 It has been a chili-fest at home ever since the 10 plants started bearing green, yellow, orange and red colored fruits. We planted three varieties this year- Mazzetti, Habanero and Naga Jalokia. 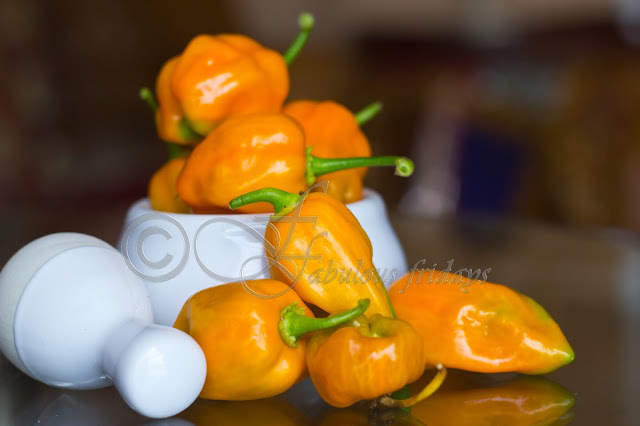 Habanero Orange variety of peppers are crinkled bright orange colored beauties, about 1 inch in diameter and 1 1/2 inches in length. They start off as light green fruits and take about 60-65 days to change the color to orange. They are also slow at the germination stage but oh! boy are they worth the wait. They have a distinct smoky taste and are dangerously hot measuring about 200,000 - 300,000 scoville heat units. Scoville is the standard for measuring heat in a pepper. So the green bell peppers are 0 scoville units and cayenne pepper is rated 35,000, just to give you an idea about the heat level. Storing and preserving these gems is important because it it impossible to consume these in a hurry. You can wash, dry and then freeze them in a heavy duty freezer bag for future use. 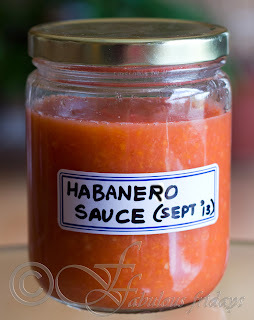 Making a hot sauce is another way. 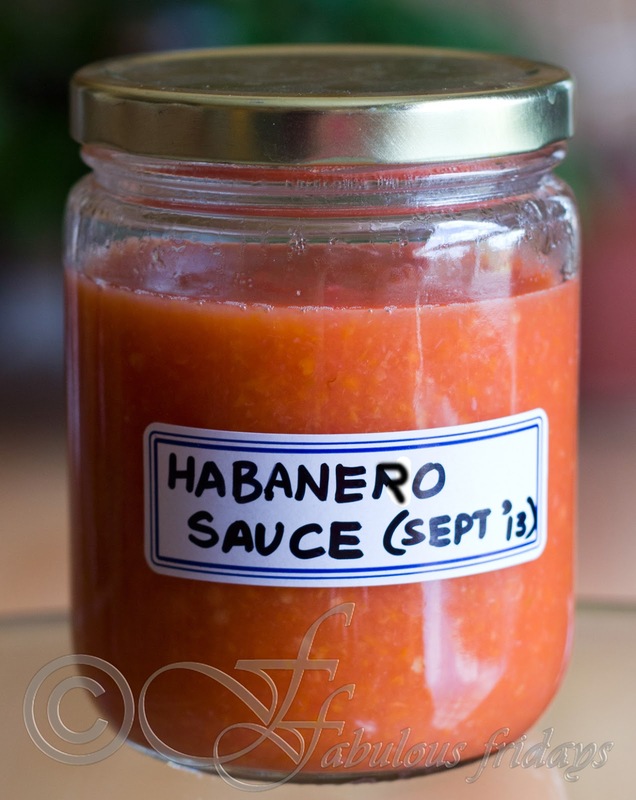 This can be used in marinades, sandwiches, burgers, burritos, etc. Chop the onion and chilies (using gloves). Take the first four ingredients and blend them together to form a smooth puree. Transfer puree to a pan and bring to boil with whole cloves. Cook on high for 4-5 minutes. Be careful to not breathe over the boiling liquid. It is extremely intense. Transfer to a clean sterilized air tight glass jar. Will keep for 4-6 months. 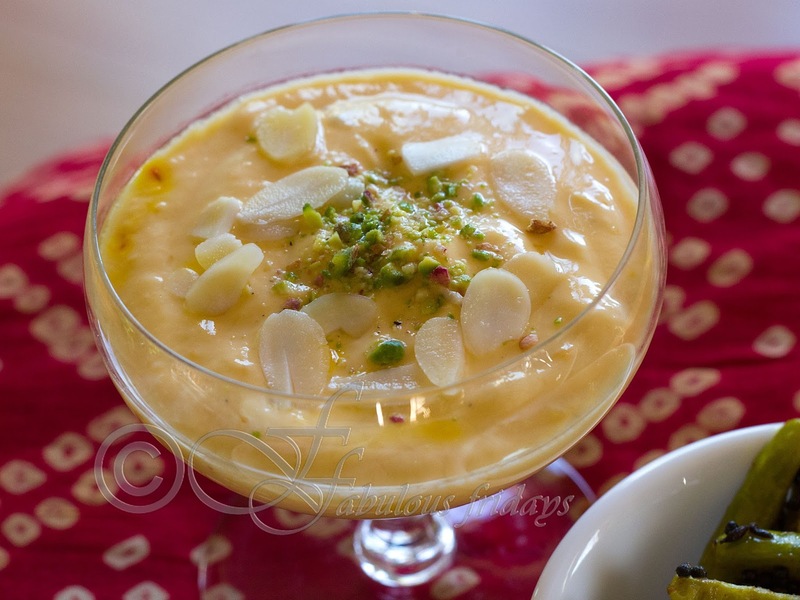 This creamy delicacy is made from hung yogurt and flavoring agents such as saffron, cardamom. 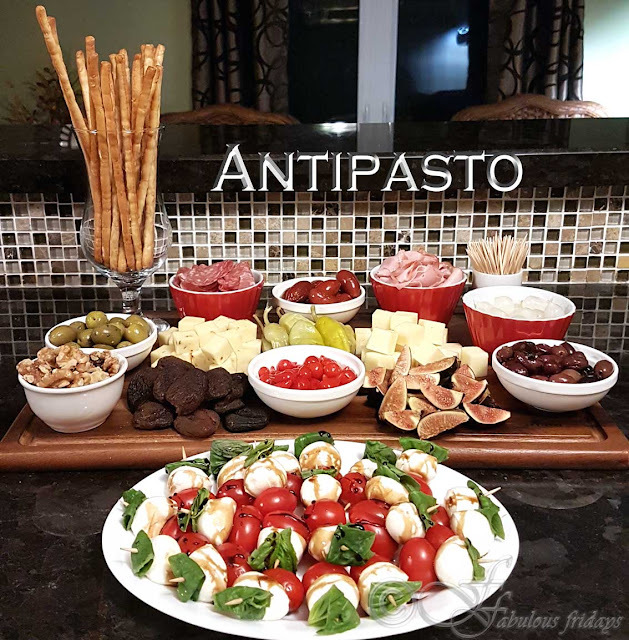 A few simple steps transform this into a delicious indulgence making it a choice for weekend and festive meals. Add fruit for added variety. A must try for all. 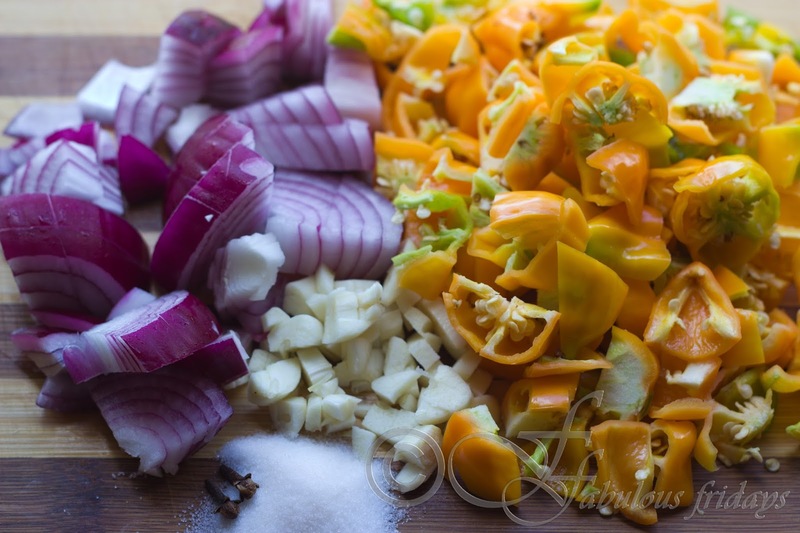 Mix all ingredients together for a few minutes till sugar combines well with everything. Chill for 2-3 hours and serve garnished with almonds and pistachio. Place a sieve lined with cheese cloth over a bowl. Put 2 cups of plain yogurt (yields 1 1/2 cups of hung yogurt) on the cheese cloth, cover and place in the refrigerator overnight (minimum 4-5 hours). All the water from the yogurt will filter out into the bowl leaving a thick creamy hung yogurt perfect for shrikhand. 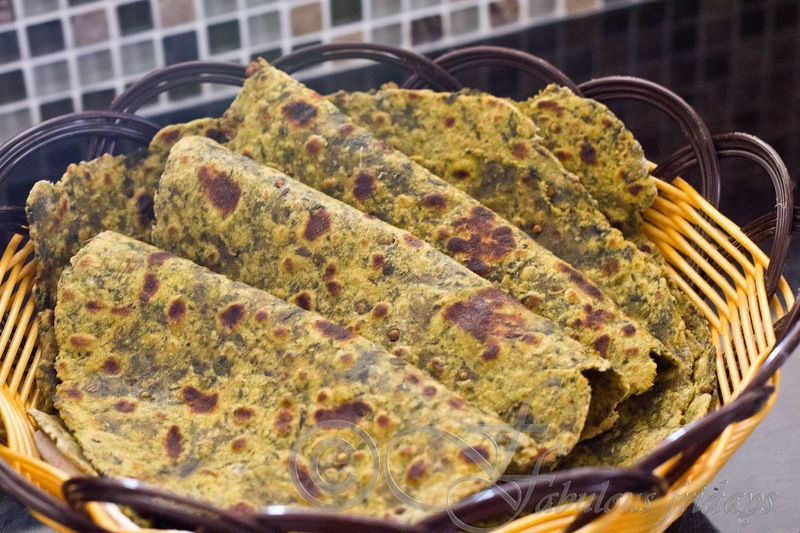 Thepla is a delicious nutritious flat bread inherent to Gujarati cuisine. It is a fave item for picnics and long train journeys as it keeps well at room temps for a long time. Soft thepla rolled up in mango pickle or chhunda with a cup of hot tea just hits the spot. Here's how you can make your own. Take the two flours in a deep bowl and add methi, ginger, chilies, red chili, salt, turmeric, cumin, sesame and ajwain. Add oil and yogurt and incorporate them evenly in the mixture. Use water as needed to make a smooth and pliable dough. Knead for 2-3 minutes and let it rest covered in a damp paper towel for 10 minutes. Divide the dough in to 12-15 equal portions and roll them in in your palm into a smooth ball, flatten. Press the dough in dry flour and using a rolling pin roll them into thin 5"-6" diameter circles. Heat a non stick skillet on medium high. Place the rolled out dough on it. Turn after 30 seconds. The semi-cooked side should have a few brown spots. Spread 1/2 - 1 tsp oil on the top side and press down with a spatula to distribute the heat and ensure even cooking. Turn and spread oil on this side as well and turn again till both sides re cooked and golden. These will keep well at room temperature for 2 days. They also freeze well. Omit methi and proceed for a plain thepla. Add a ripe mashed banana to the dough while kneading and omit oil. This will keep the thepla soft and give a slight sweet taste. Substitute 1 cup grated lauki(bottle gaurd), or 1 cup grated radish for methi. Be aware that these veggies will contain more water content than methi and you might need just a few sprinkles to knead the dough. Substitute ajwain seeds with 1/2 tsp white sesame seeds for a flavor variation. 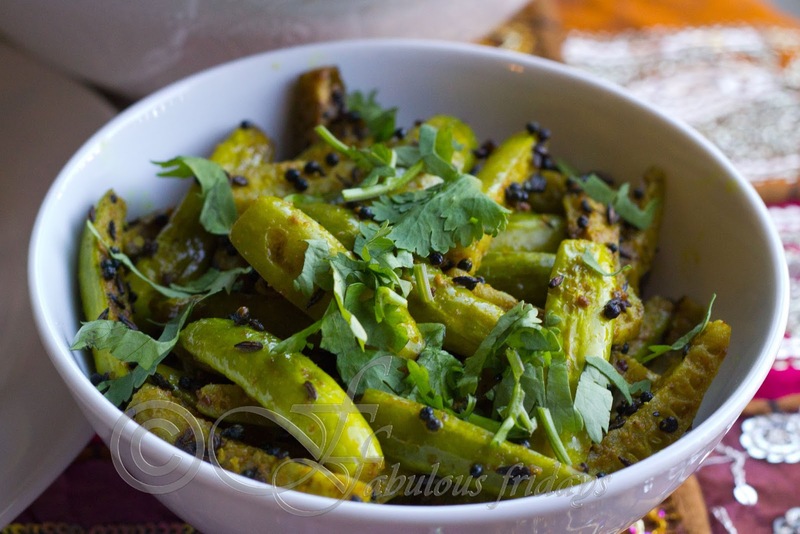 Tindoora or ivy gourd is a gherkin like veggie which makes an excellent accompaniment to any meal. Tossed with spices, cooked tender crisp, and rolled inside thepla mmm...mmm...good. Heat oil in a pan. Add cumin and mustard seeds along with hing and let them crackle for 10 seconds. Add tindoora and all other ingredients except jaggery. Stir fry without the lid on medium heat for 7-10 minutes till tender crisp. If you want it more tender then cook with lid on. Remove from flame and add grated jaggery. Mix well. Chilies and peppers come in every shape size and color and almost all over the world you will find a stuffed pepper or chili preparation. Such a versatile dish deserves its own post. So here goes the Gujarati version. 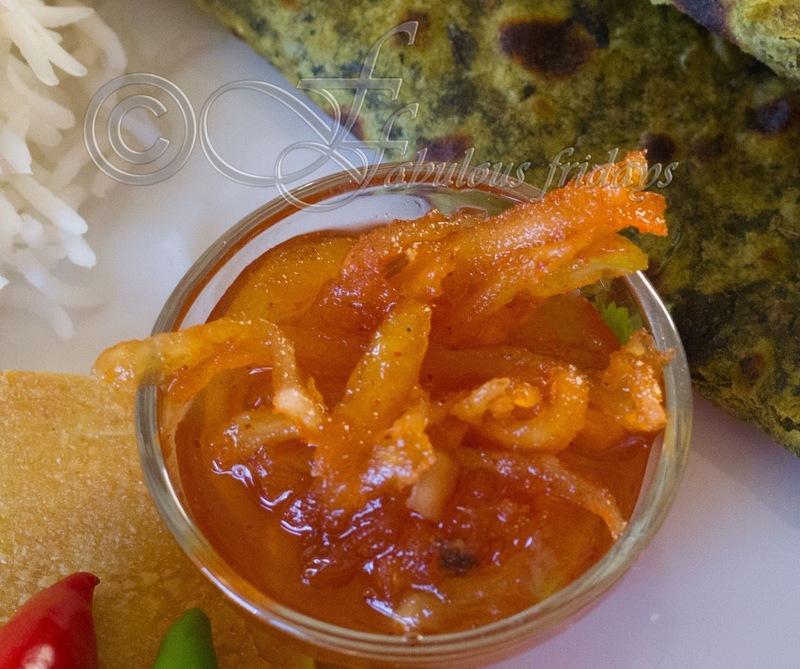 Hot and sour with a hint of sweet will tantalize your taste buds and liven up any meal. Dry roast the besan in a medium hot pan till it turns slightly brown and imparts a cooked aroma. 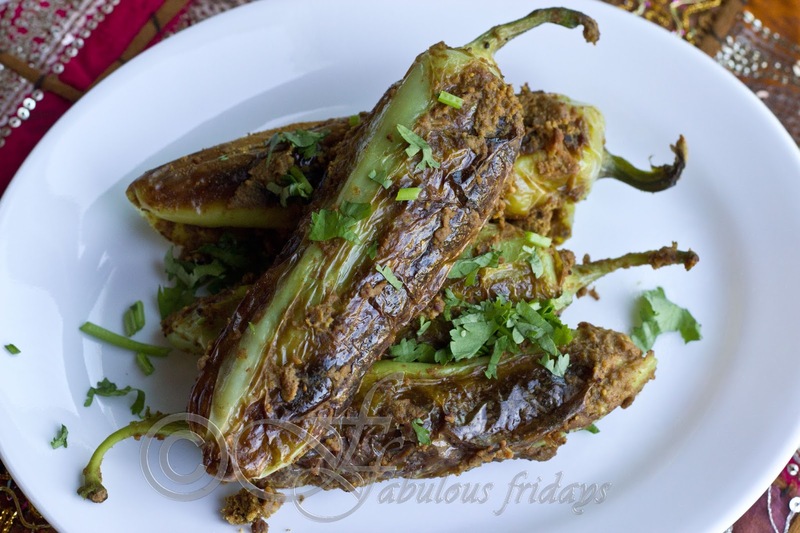 Cool and add salt, coriander, cumin and turmeric powder, jaggery, lemon juice and 1 tbsp oil. Sprinkle some water to make a thick paste. Wash and pat dry the chilies. Slit them lengthwise keeping the stem intact. Stuff these with the prepared stuffing. Heat the remaining oil in the pan, add hing and carefully place the stuffed chilies in a single layer. Cover and cook on low for 15 minutes till cooked and browned evenly. Serve with rotla, kadhi and /or dal. This traditional dal recipe has a characteristic sweet and sour flavor and is an inherent part of the Gujarati food culture. This everyday dal uses all the typical spices and ingredients that you see in a lot of other Gujarati dishes. 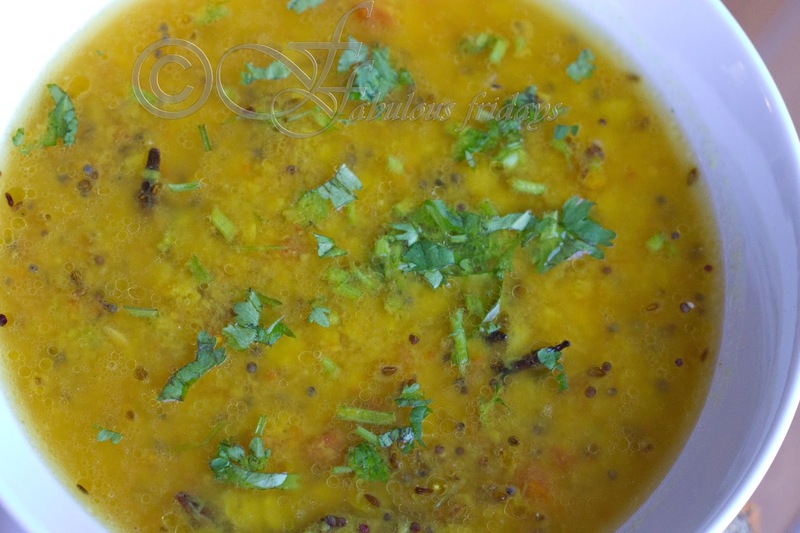 Tuvar dal is the most widely used dal in Gujarat and for special occasions it is boiled several times till achieve that ideal balance of that sweet and sour levels. Eat it with rice or rotli. Wash dal and put it in a pressure cooker along with water, salt, turmeric, coriander powder, grated ginger and green chilies. Pressure cook for 2-3 whistles. While this cools melt ghee in a pan at medium heat and add cumin and mustard seeds. When seeds crackle add the hing, cloves, cinnamon, curry leaves and round chilies. After 10 seconds add the tomatoes and saute for 5. Add a few tablespoons of water to help soften the tomatoes. Add red chili powder and put this tadka in the cooked dal. Mix well, add jaggery and lemon juice and boil for 1-2 minutes. Taste to adjust the sweet and sour balance. Serve hot garnished with coriander.